If you were recently stopped for DWI, you probably have questions about what you can expect throughout the process of fighting the charges. As skilled DWI attorneys in New York City, we want our clients to have a clear understanding of the steps involved in a DWI case. First and foremost, we believe that getting a defense attorney involved in your case as soon as possible is a wise move. We are not attorneys who focus on “quick pleas and quick fees.” Rather, we build a strong defense that focuses on protecting your rights, freedom and future. 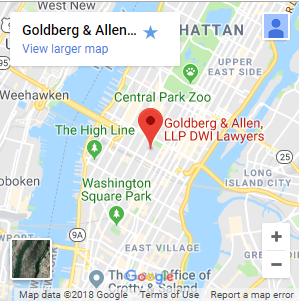 Call Goldberg & Allen, LLP, today at 212-766-3366 for a free case review. Arrest: Law enforcement officials can make the arrest at the traffic stop, if they believe there is probable cause to arrest you. At the traffic stop, you may be administered field sobriety tests and a breath test. Precinct testing: When a law enforcement officer brings someone in for suspicion of DWI, that person will be asked to take a breath test and to perform a number of coordination tests. This process is videotaped and the person has the right to refuse the tests. Refusal of the breath test, however, can result in the loss of the driver’s license. If the arrest is processed, the person will be fingerprinted, photographed, and brought to court for arraignment. Arraignment: At the arraignment, the person will be read the criminal charges against him or her. The arraignment will also involve a hearing to determine if bail will be allowed or not. In New York, nearly everyone arrested for drunk driving is released without bail unless there are aggravating circumstances or the person is charged with felony DWI in New York City. At the arraignment, a future court date is set. Attorney prepares effective defense: If you hire a defense attorney from Goldberg & Allen, LLP, we begin preparing (or have already begun preparing, depending on when we first reviewed your case) an effective defense to the charges. We ultimately seek to have the charges dismissed. This can be attained by challenging the evidence. We will determine if the police had probable cause to stop you. We will also analyze the administration and results of the breath test and coordination tests. Pleas: While we are not a “quick plea, quick fee” law firm, we may advise our clients to accept a plea when appropriate. For example, if pleading guilty to a DWAI instead of a DWI would give you the best possible result, we will look closely at this option. Trial: Not every DWI case goes to trial. However, if yours does, you can feel fully confident with a defense attorney from our firm arguing your case in the courtroom before a judge and jury. Sentencing: If the case is dismissed, which is always our first goal, you will not go through this step. If you are sentenced, we can talk to you about your options for filing an appeal. DWI/DUI penalties: If you are convicted of DWI, you can face penalties that include jail time, fines, driver’s license suspension and ignition interlock device on your vehicle. 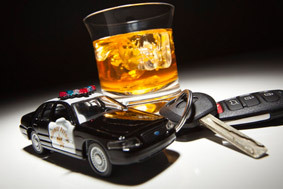 Our attorneys have won many DWI acquittals and dismissals in courts throughout the New York City area. The DWI defense process can take time. Our attorneys will be with you throughout the duration of your case. Call us at 212-766-3366 to schedule your free case review. You can also contact us online.